I saw Meet the Robinsons recently, the first digitally-projected film I've seen in a regular theater. I was curious to see how Digital-3D technology would play in full length feature. 3D has been used as a cheesy gimmick (Jaws 3D anyone?) in other films, or the technology was so ill-used I felt I had been looking through a a stained-glass window for two hours. This 3D movie was easy to watch and the "in your face" gags were kept to a minimum. Meet the Robinson's is more a kid's film than a Pixar production. There are plenty of gags involving food getting splattered and slapstick to keep the ADD kids in their seats, along with tributes to past science fiction films to satisfy adult film geeks. One such tribute is a robotic bowler hat named Doris, sporting a menacing red lens for an eye...much like a famous computer from a certain Stanley Kubrick film. The Disney animators paint the backdrop of Meet The Robinsons from a palette cinematic futures, ranging Fritz Lang's gear-driven Metropolis to fiery towers of Ridley Scott's Blade Runner. Even Disney's own The Black Hole gets a nod when Doris deploys spinning metal blades, like Maximilian the killer robot. 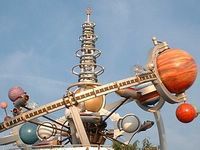 The central inspiration for the pastel towers and art-deco curves of Meet the Robinsons are the over-optimistic futures ranging from pulp science fiction covers of the 1930s to Disney's Tomorrowland (Space Mountain and the old Astro-Orbiter make a cameo in a section of the future city called Todayland). There is clear affection of Disney's creative crew for the futures that tantalized (or terrified) generations from the pulp-scifi of the early 20th century to the cyberpunk worlds of the 21st. Meet the Robinsons is a kids film at its core. Like the real Disney World, it is meant for kids, but that doesn't mean adults can't enjoy it too, and a refreshing change from some animated films that drop crude adult-oriented jokes in a vain attempt to be hip. And the 3D didn't give me a headache.